We had arrived at the airport around 2; by the time we had a voucher for a hotel room and left, it was nearly 6. We went to the hotel room (adequate but a little dingy) and collapsed on the bed for an hour or two. I massaged Lori’s legs, but wasn’t able to wholly banish the ache of standing in line for hours. But at last we revived enough to consider seeking food. But we had little oomph for deciding, and of course we no longer had any plan to follow. But we called Adam in hopes of another chance of his company. It took us a while to come to a conclusion, but when I mentioned Shady Grove, Adam said it was a great evening for Shady Grove. 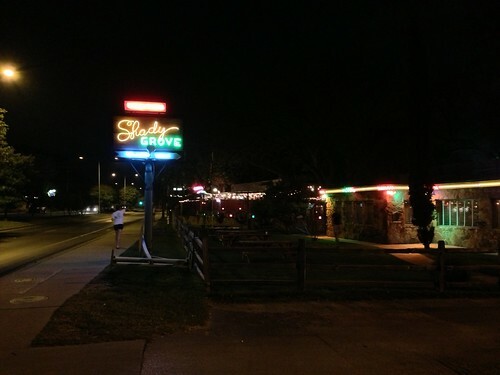 Shady Grove is listed on the Roadfood site, but I hadn’t tried hard to include it, because the review seemed halfhearted. And I thought that we were so aggravated that we wouldn’t be able to really enjoy any restaurant. 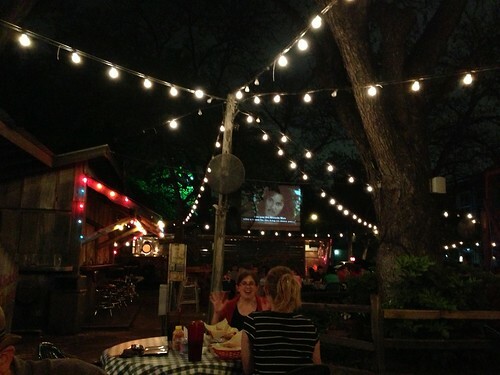 But our experience at Shady Grove was simply idyllic. I think that we came at the perfect time to enjoy Shady Grove - both the perfect time of day and the perfect time of year. It had been hot during the day, but because this was April, it did cool down in the evening. So the weather had the balmy languor of a warm evening that feels cool by contrast. And they were showing The Princess Bride, with subtitles. 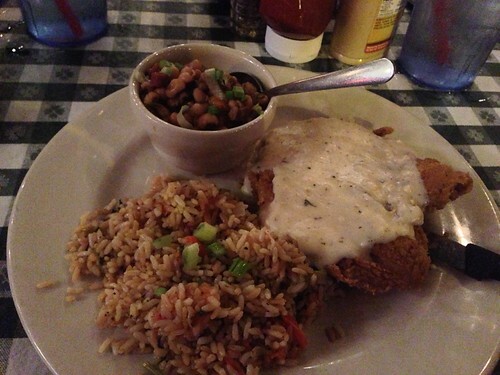 I ordered the chicken fried chicken, with sides of black-eyed peas and green chile rice. The difference between fried chicken and fried chicken can only be explained in the context of chicken fried steak. Chicken fried steak is notionally beef fried in the manner of fried chicken - but the recipe has taken on an identity of its own. So chicken fried chicken is chicken fried in the manner of chicken fried steak, usually as a boneless chicken breast batter-fried and served with cream gravy. I don’t know what it would be called if you fried steak in the manner of chicken fried chicken. The chicken fried chicken was extraordinary, tender and crisp and succulent - it was head and shoulders above the chicken fried steaks we had had at Threadgill’s and Hoover’s. The sides were both very good as well. The green chile rice had a strong capsaicin kick. Lori ordered the country fried chicken salad and found it yummy. She noticed that the menu description said it came with fried green chiles, so she ordered them on the side because she has hardly any tolerance for chile heat. 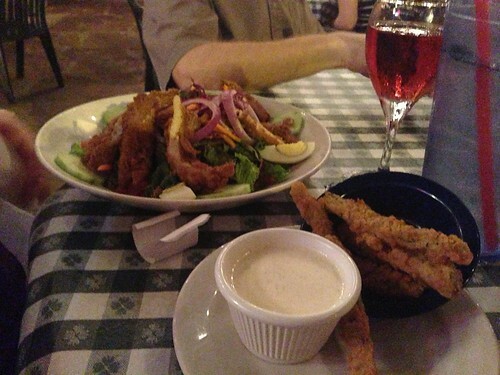 I’d expected that the fried chiles would be crouton-sized hunks or slices, suitable for eating in a bite as part of a salad. But these came in foot-long spears with little heat - they would make a great appetizer. 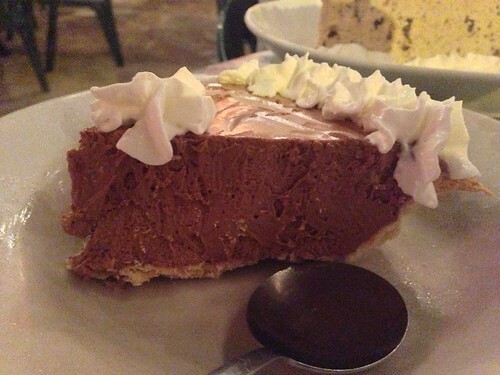 The menu says “Ask about our amazing desserts… they are deliciously homemade!” and in such matters we are nothing if not biddable. We ordered three desserts and shared them all. 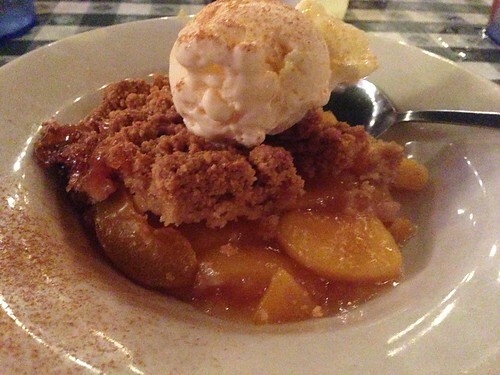 The peach cobbler was the best cobbler of our visit. It had a crunchy, streusel-like topping. Chocolate icebox pie was certainly, but to my fatigued palate, it tasted little different from a more common French silk pie. 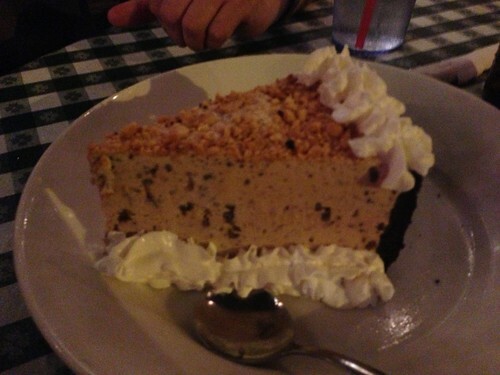 Peanut butter cheesecake touches on one of my own food prejudices, but Lori and Adam enjoyed it. 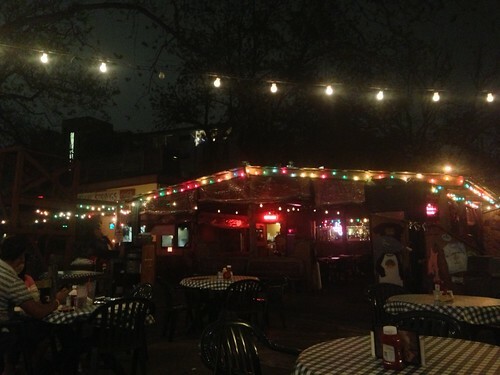 Our evening at The Shady Grove delighted us far beyond my expectations. I wouldn’t go so far as to say that it entirely compensated for the airline frustration, but it was certainly a brilliant silver lining.